It’s been one week since I sketched last. Way too long. One thing I have noticed since I began sketching is that the more you do it, the more you Need to do it. It’s like chocolate. Have you ever needed a piece of chocolate really bad? That is the feeling I get when I need some sketching time. It’s like a craving that won’t pass until it’s satisfied. Today was one of those days. Actually, the last few days have felt like this. Sketching grounds me, relaxes me, helps me focus and is a form of mindfulness to me. Even if I only do it for 20 minutes it still helps. It’s like a power nap! At the end I feel energized and ready to go back to work. This is the outcome from my 20 Minute Sketch! 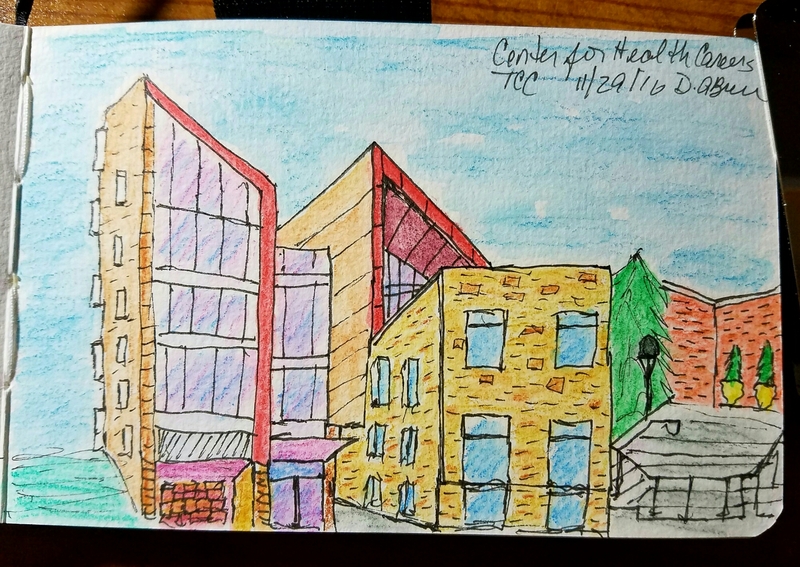 After grabbing a bite at my favorite Mexican restaurant I parked across the street and from the car I sketched the Science Building at the Tacoma Community College in University Place, Washington. I love the architecture in this building and this community college has a few new buildings like this. Until next time and Happy Sketching!